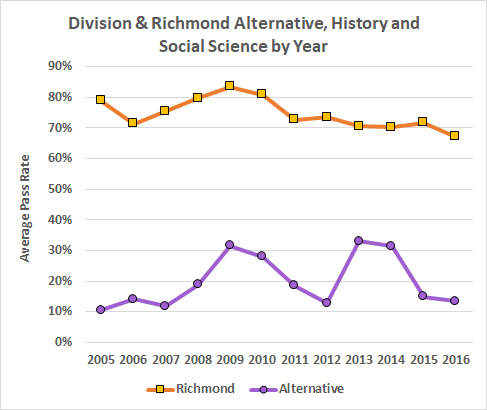 The estimable Carol Wolf points to an piece in The Atlantic that discusses outsourced alternative schools and Richmond Alternative in particular. 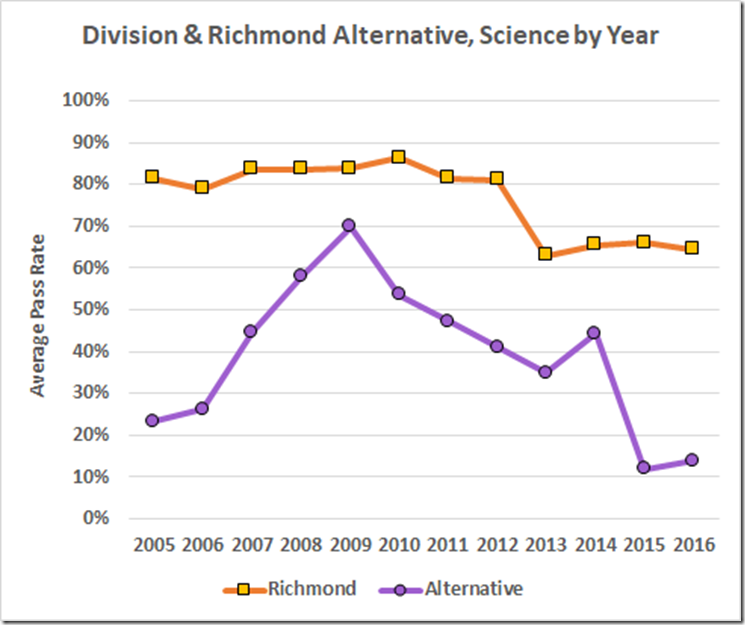 To the point here, RPS hired Community Education Partners in 2004 to run this receptacle for disruptive students. 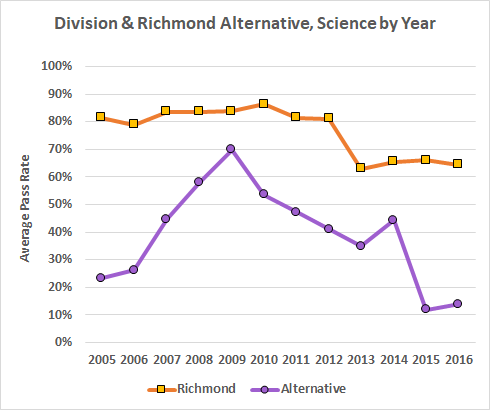 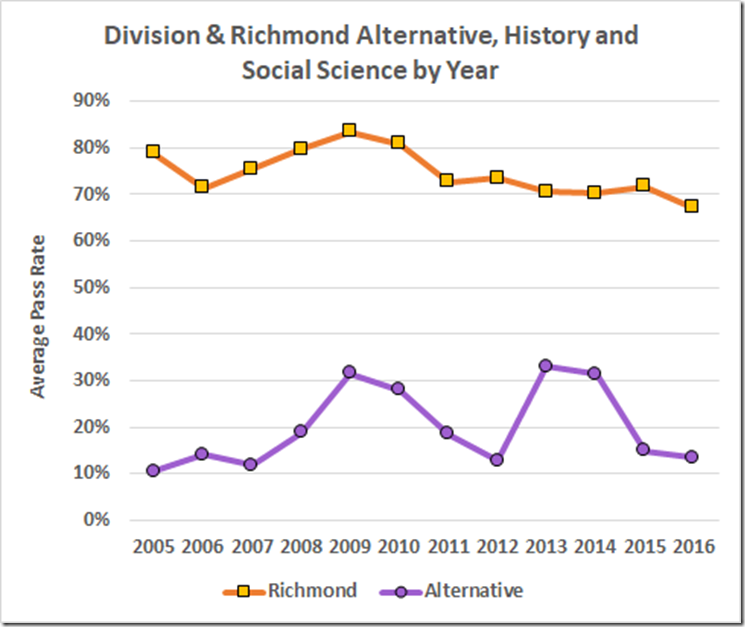 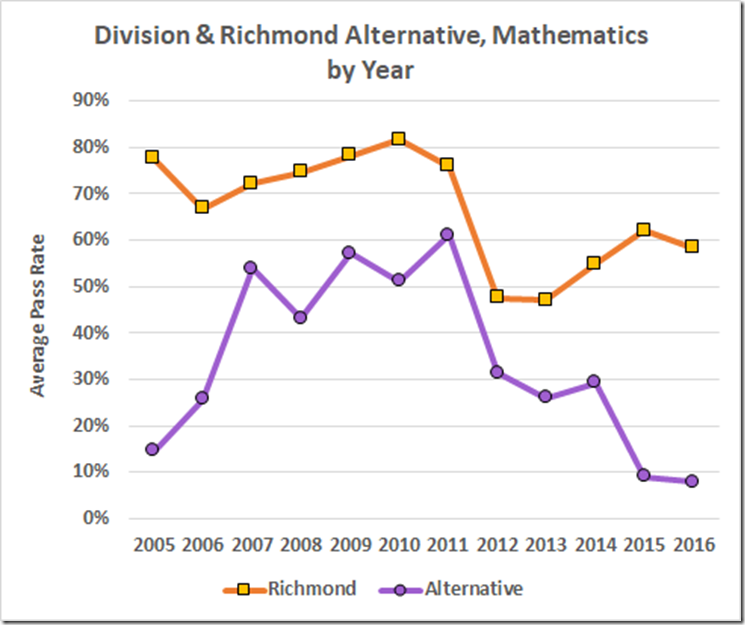 In 2013, Richmond took the school over, saving about $2 million per year. 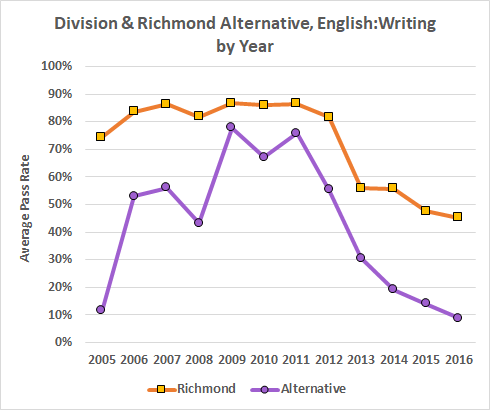 They now have hired Camelot Education to take it over. 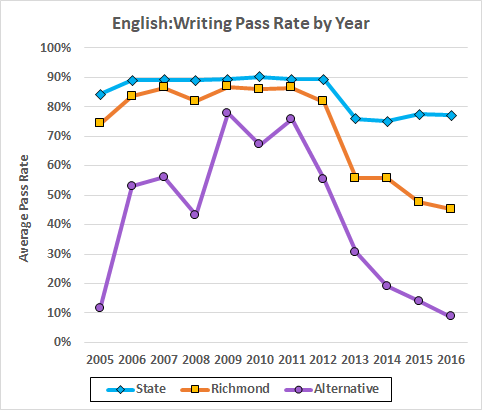 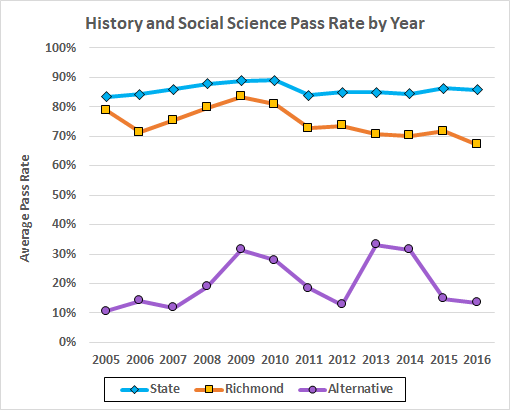 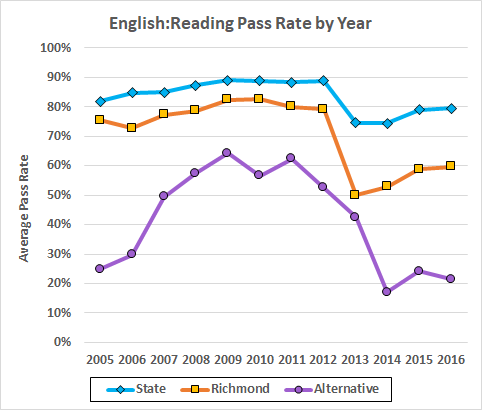 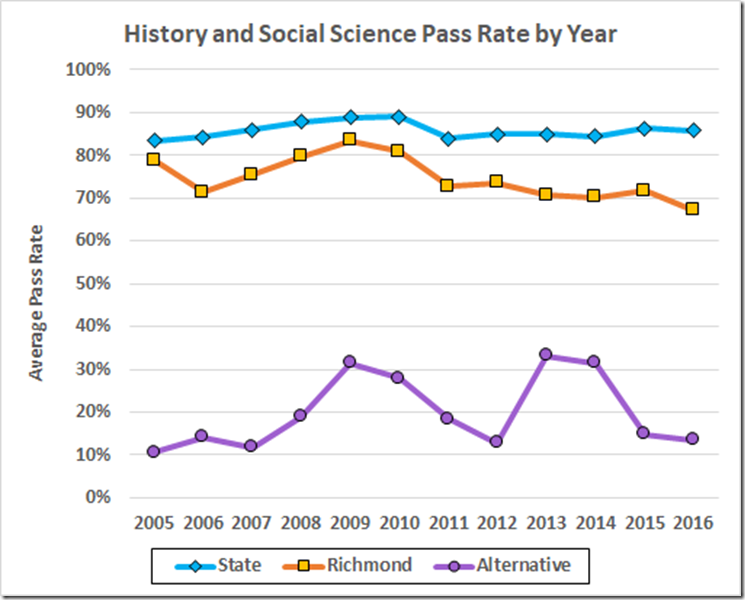 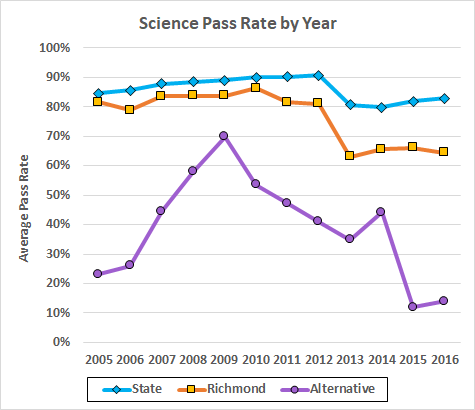 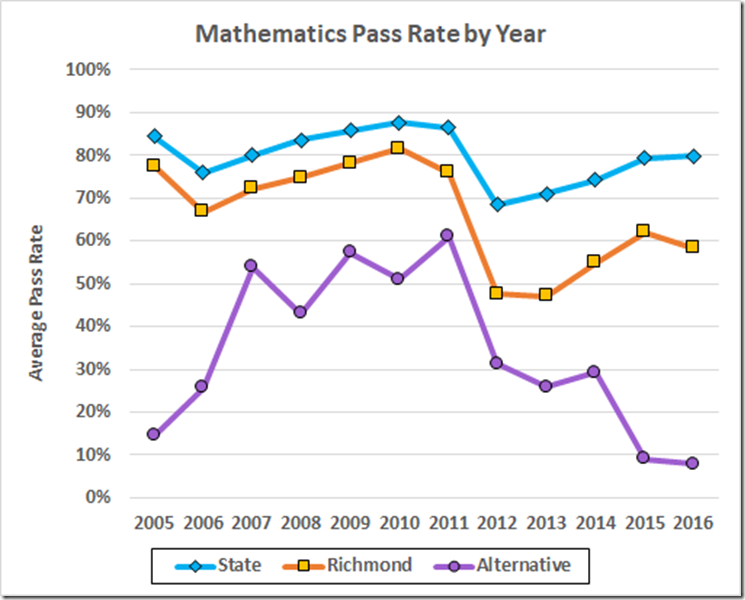 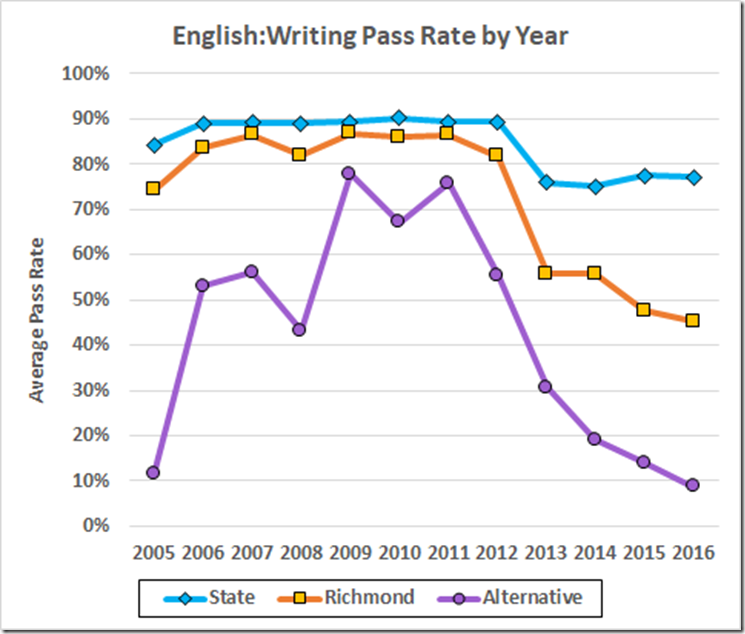 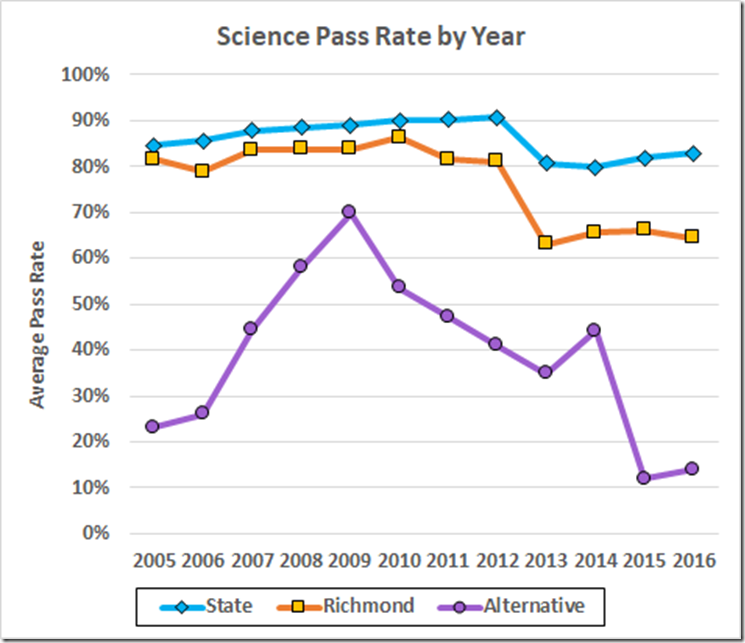 The pass rate history (sorry, 2005 is as far back as the database goes) shows that CEP was doing a remarkable job with a tough crowd, and RPS then demonstrated that it could not handle those students. Indeed, with the lowest division average in reading last year and the second lowest in math, RPS has demonstrated that it can’t educate the non-disruptive students either. 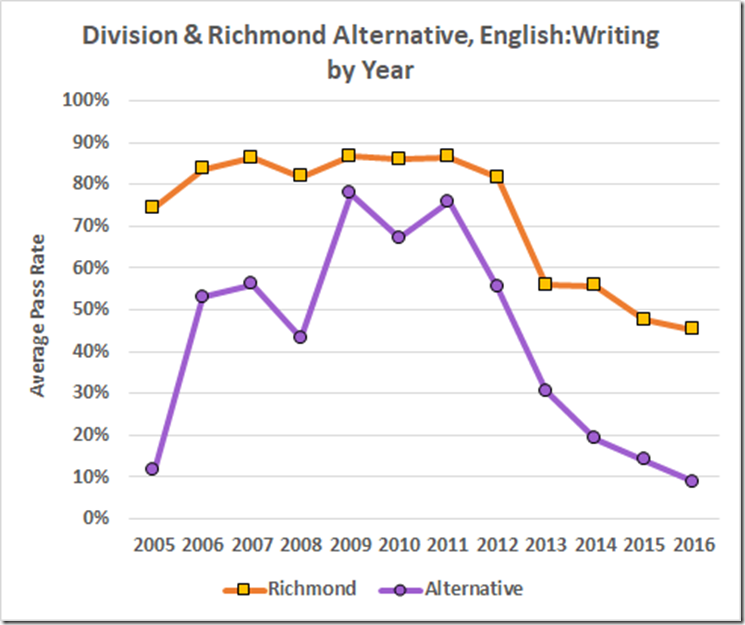 Added Note: A reader points out that this last sentence could be taken to say that RPS cannot educate any of its students. 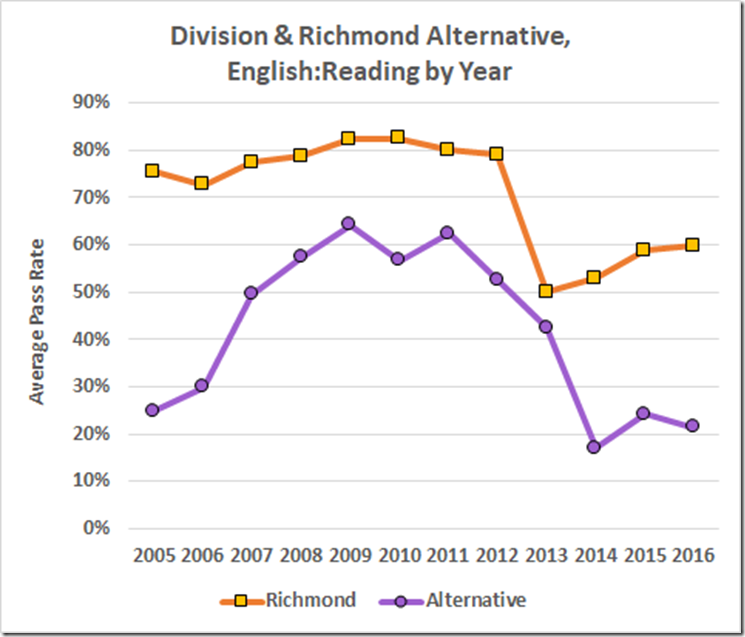 For sure, it would be more accurate to say RPS can’t educate too many of its non-disruptive students. 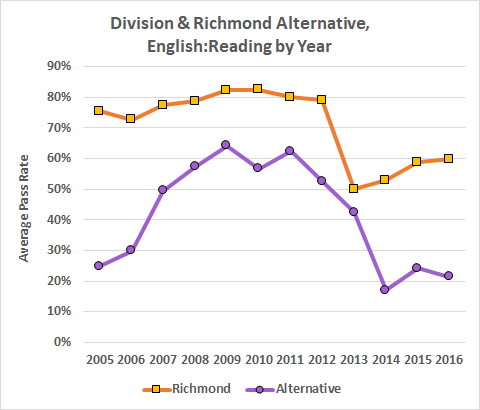 Unfortunately, in contrast to Carver, which is doing a splendid job, we have Woodville and MLK and too many others that approach their dismal performances. 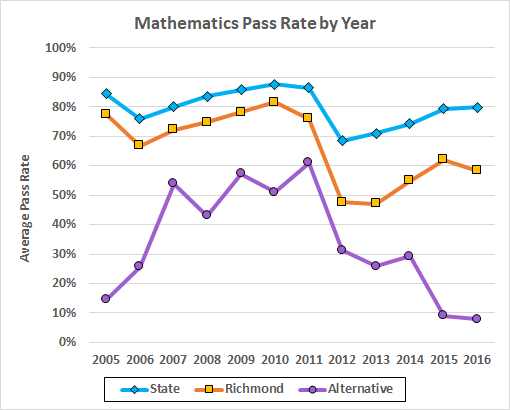 The result is our awful averages. 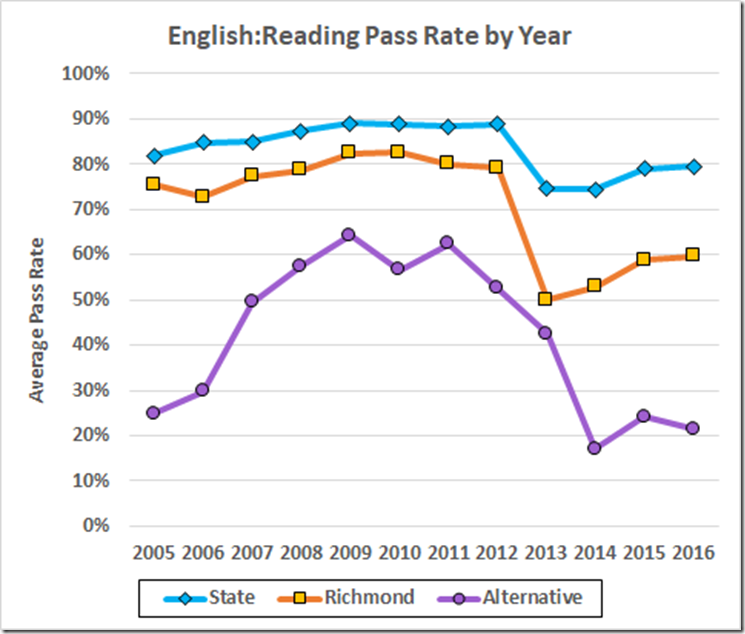 2d Added Note: Here are the same data with the State averages included.